State Library Victoria – Oy vey! It’s International Jewish Genealogy Month! Oy vey! It’s International Jewish Genealogy Month! Yes, October 17 to November 14 is International Jewish Genealogy Month. The International Association of Jewish Genealogical Societies is the coordinating agency. Their website has links to a variety of useful resources for Jewish genealogy. 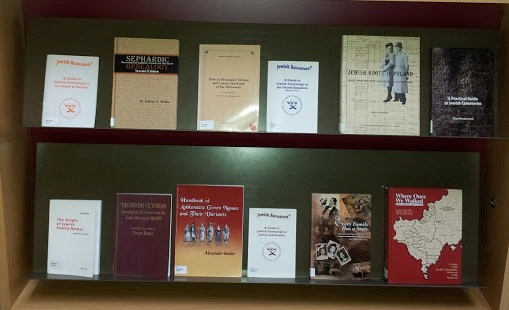 The State Library of Victoria holds a range of books specifically on Jewish genealogy. Jews have been coming to Australia since the first fleet when an estimated 7-16 Jewish convicts were on board, presumably reluctantly! But they’ve been coming ever since, usually by choice, in varying numbers, depending on world events. Therefore, most obviously, the largest wave was post World War II with thousands, mostly Holocaust survivors, arriving (see “Jewish immigration after the second world war The transformation of a community” by Suzanne D. Rutland, University of Sydney). 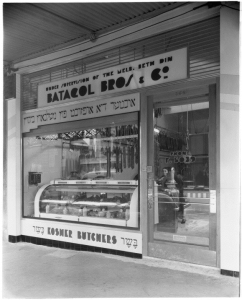 For your Jewish ancestors born or settled in Australia the general tools used for Australian genealogical research will help. Have a look at the range of Research Guides on family history compiled by State Library staff. The State Library has a range of items in its collections more broadly of relevance to Jewish historical/genealogical research, eg the Raoul Wallenberg Holocaust Collection (dedicated to the memory of the Swedish diplomat who saved over 100,000 Jews and many Christian partisans from Hitler’s concentration camps before he was arrested by Russian troops in 1945 – and was never seen again). The National Archives of Australia (NAA) have a fact sheet (no 217) advising of a range of records on Jews in Australia. TheAustralian Jewish Historical Society publishes its own journal with a wealth of articles of interest for family historians. The last several issues of the Australian Jewish historical society journal have been digitised by the AGHS, and so may be accessed on line. The Society’s web site has also made available an index for all issues from 1939-2010. You can use this to then access the print version at the State Library. The years 1939-1985 are also available on a cdrom database on any pc in the library. Another great avenue is the Australian Jewish Genealogical Society (Victoria). They have regular meetings and workshops, and also a selection of their own records not held by the State Library. They are well supported by the Lamm Jewish Library of Australia which anyone may join for a fee to access a great collection of books, journals, dvds and other materials. Also, register for free on the international Jewish genealogical site, Jewishgen. Rebekah is a reference librarian at State Library Victoria. She specialises in health and medicine.